Disclosure: This post was sponsored by Houghton Mifflin Harcourt as part of an Influencer Activation for Influence Central. When I became a parent, one of the things I wanted to pass down to my daughter was a lifelong love of learning. My parents had given me the gift of curiosity, interest in anything new, and a desire to learn about anything and everything. I remember my mom and dad would encourage me to find something interesting in life around me, to never be bored, and to always be curious. I’ve always loved reading and that partnered with the feeling of finding joy in learning new things, perfectly. There are so many things available to us to teach our children, where do we turn to find the right learning resource? 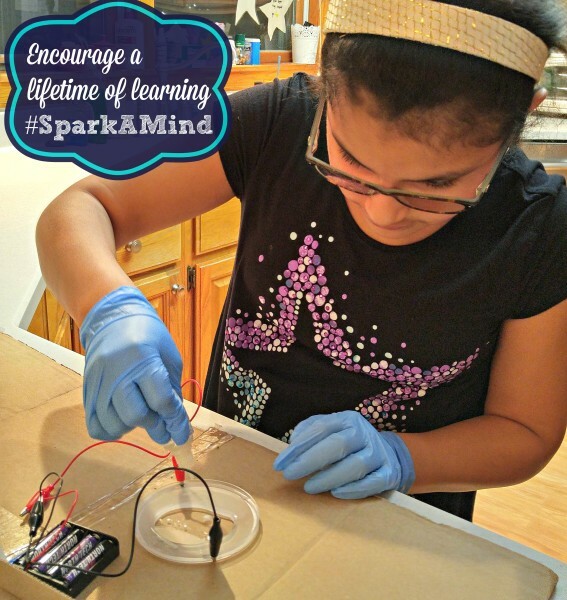 How does a parent spark curiosity in their child? 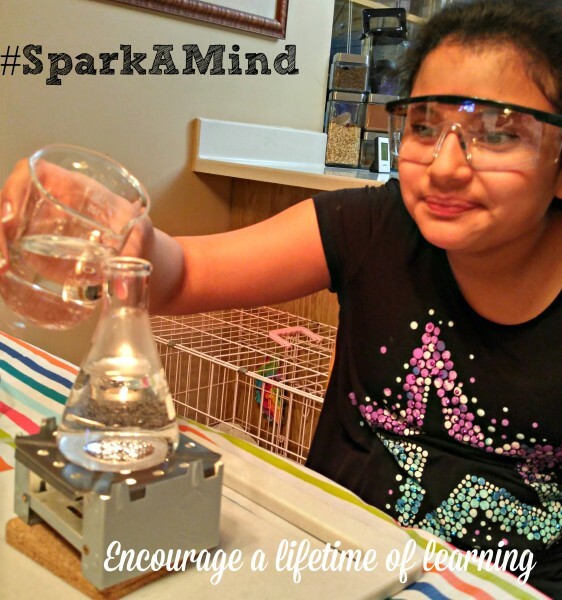 For me, I saw the “spark” of learning generated in my daughter, when she had fun learning. And one of the ways that we had fun was through the character of Curious George. Curious George is, for our family, still to this day, entertaining and funny (all the while, still teaching us!). From the very first Curious George book, to the 74th episode (I really think we had that many recorded) we watched on television, George taught my daughter, the excitement and fun that could be found all around us. In the most ordinary, every day things, like weather, George could discover fascinating things. 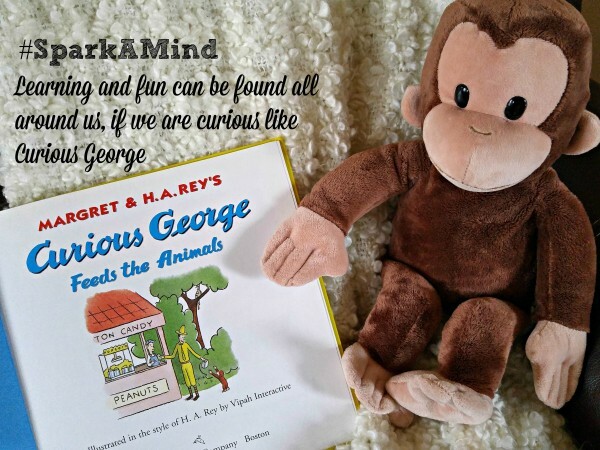 In thinking about this post, and what “sparked” excitement in my daughter’s early learning, I ran across a study that explored the effects of Curious George on children and parents. No surprise to me, the study found that books and television shows promoted scientific habits. What are scientific habits? It’s a way of thinking that is characterized by curiosity, asking questions, making and testing hypothesis or predictions. It means your child can be encouraged by books and educational programs to interact with the world around them, wanting to learn “why” and “how” things happen. The US publisher, Houghton Mifflin Harcourt believes that everyday moments can spark curiosity and stimulate the mind in an instant. And when our children are curious, it adds up to a lifetime of learning. By encouraging “sparks” in the minds of our children we can make a lasting positive impact in our children’s lives. They’ve started a program called #SparkAMind. 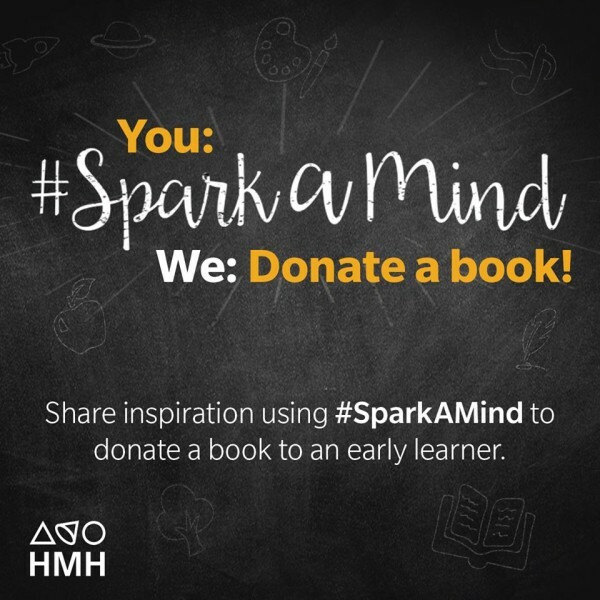 Every time someone uses #SparkAMind, it appears on the #SparkAMind mini-site and Houghton Mifflin Harcourt will donate a children’s book to an early learning organization. This program helps close the early education gap and prepare children for long-term success in school and in life. In addition to publishing children’s books and sponsoring children’s programming, Houghton Mifflin Harcourt has created an early learning app designed for kids ages 3-7 with over 500 fun and educational games, videos and books called The Curious World app. They are offering a special discount to KLY readers! 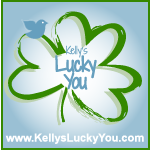 Please check it out here: The Curious World. to learn more about Early Learning and #SparkAMind. I still remember learning with Curious George. He’s a favorite! I think my kids would love The Curious World application! This fact makes me sad….61 percent of low-income families have no books at all in their homes for their children. Reading and learning really are so important. I love when companies give back, and think#sparkamind is a great program that Houghton Mifflin Harcour has come up with. I love when publishers support getting books into the hands of children who don’t have ready access to them! My parents had me reading at a very young age and it sparked a lifetime of learning for me. I hope to pass along the same spark to my nieces and nephews. I always buy them books and other engaging gifts instead of toys. When they were really young they grumbled a bit, but my oldest niece is about to graduate high school with high honors and an IB degree, so I feel like I helped to contribute to that (her parents are NOT readers). Curious George is my favorite! Yay for publishers stepping up! Megan @ reading away the days recently posted..Q & A with Esty Store creator Made By Birdies & discount treat! Any program that promotes books for children is A+! I feel bad for families that cannot afford books for their children to read. I loved reading as a kid, this is a great way to get kids to start reading. I really credit my mom’s reading to me at a young age to my love of reading. This is a great program. Perfect way to inspire kids to gain knowledge . A teacher says “Readers are Leaders.” True. We don’t have a lot but we do go to the library and we buy books from yard sale and thrift stores. I loved reading Curious George as a kid and to my kids. Another book I liked is Mrs. Ticklefeather which had wonderful illustrations. Love the stuffed monkey. So great that she seems to be having so much fun learning! We watched Mr. Wizard’s World when I was growing up and I loved learning all sorts of things from it. Just tweeted #SparkAMind. This is great! Scientific habits are so important. I do all I can to encourage and promote learning with our kids. Yes! Get kids off the electronics and get their minds blossoming! Books are so important for learning. These science projects definitely look like a lot of fun! Great article showing the importance of learning! It is really sad how many people don’t have books in their homes. They are an important tool in learning. Besides having books, we frequently visit our local library. Wow, what an awesome post. I love the different ways kids are learning. I too loved Curious George as a child. Loved this post! I think reading is ready important and every child deserves the opportunity and shouldn’t be deprived of reading books just because of their family’s financial situation. I’m very glad that HMH is being so generous and giving children from low-income families the opportunity to be able to read books! Great post! I think it’s important to encourage children to read and learn! It’s sad to hear of low-income families not having access to something as great as books! Every child should growing up learning to love books and enjoying them. I am glad there are people donating to this cause! 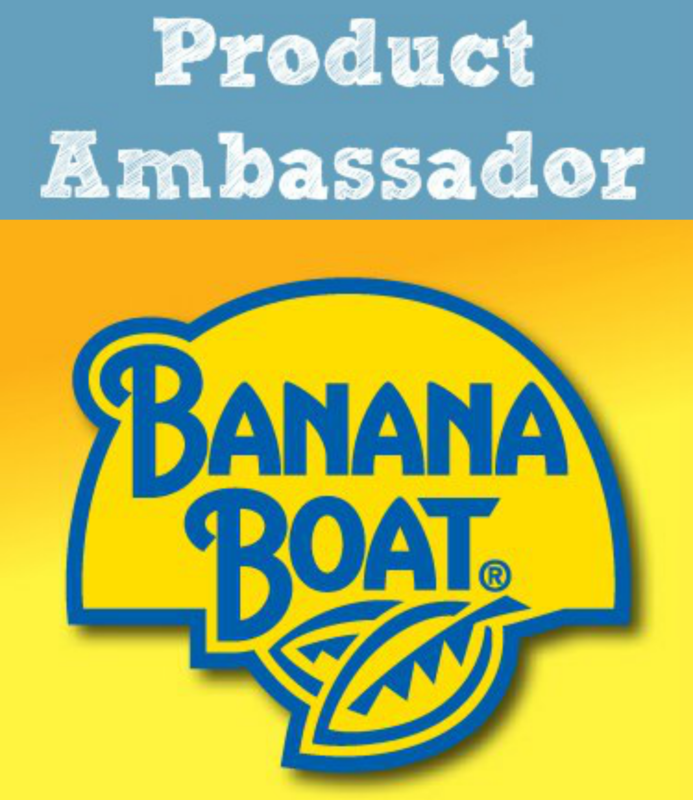 I would like to thank you for featuring this fine program. It looks like it does a lot of great things. It was fun to read to my children, and we watched The Magic School Bus & Bill Nye. Now, someday I will do the same with my grandchildren. Any activity that sparks the creativity, imagination or interest in learning in a child is great.